Visitors to the Saigon Zoo and Botanical Garden on August 10 got a chance to admire three healthy Bengal tiger cubs for the first time since their birth last month. 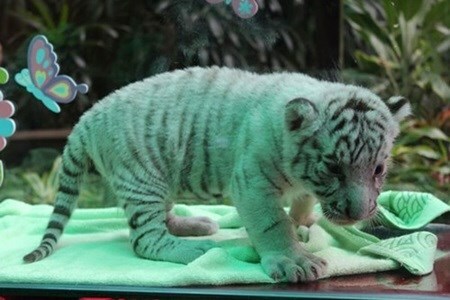 The three white tiger cubs were born to Lem and Luoc, the tiger and tigress in the zoo in District 1, HCM City. Like their parents, the young cuddly tigers boast of a creamy white coat with black stripes. According to the World Wildlife Fund, the number of white tigers had reduced from 100,000 in 1990 to about 3,200 in 2013. These are the first cubs of the two tigers, belonging to the magnificent Bengal Tiger breed, or Panthera tigris.